YAH, the Lord of Hosts, the living elohim, King of the Universe, Omnipotent, The Merciful Gracious God, Supreme and extolled, Dweller in the height whose habitation is Eternity, who is Sublime and Most Holy, engraved His name and ordained the Universe in thirty two mysterious paths of wisdom, by the three Sephariam, namely, Numbers, Letters and Sounds, which are in Him and one and the same. Most Systems of faith have an esoteric or external level of understanding that is aimed at the masses, and an esoteric, or inner level of meaning that is the reserve of the priests and initiates. 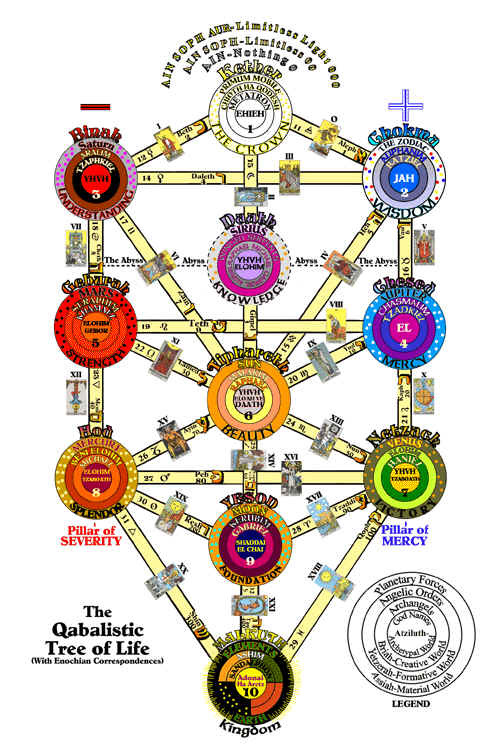 The deeply mystical Kabbalah is the enigmatic aspect of the Jewish doctrine. The word has its root in Hebrew, QBL, meaning "to receive or alternately "mouth to ear" or "the unwritten law," and like most mystery traditions its secrets were originally communicated orally. It shares the same root as the word Cabal, meaning "secret intrigue." Kabbalah spread to to other parts of the world. Moses to had Kabbalistic instruction directly from God. According to Jewish mystics, he spent forty days learning its secret doctrine from the angels while he was wandering in the Desert. Thereafter, Moses concealed the teachings that appeared for the first time in written form in the first four books of the Old Testament. In the first century Rabbi Simeon Ben Jochai had to hide in a cave with his son for twelve years, avoiding execution becuase of his criticism of the Roman Empire. During this time, the Rabbi taught secrets of the Kabbalah to his son, and these teachings appeared as a book, published in the thirteenth century Spain, called the Zohar. It is this book which is the cornerstone of the Kabbalistic doctrines. The universality of the ideas within the Kabbalah means that it has been adopted by numerous different religions. Not surprising, since the beauty and logic of it construction is awe-inspiring and all-encompassing. There was a general upsurge of interest in esoterica in the Middle Ages and this time saw the development of a Hermetic Kabbalah, a combination of Kabbalistic teachings and Greek Hermeticism. In turn, alchemy and Rosicrucianism were influenced by its secrets as was Freemasonry. The tarot takes its influence from the Kabbalah. The Golden Dawn based its symbolic language, thousands of years after the angels imparted its intricacies to the First Man. The doctrine encompass The Four Worlds and the Tree of Life, while the latter, in turn, encompasses the Ten Numbers and The 22 Letters.